The 1st international workshop on Glossy ibis Plegadis falcinellus will be held between the 27th and 29th November 2017 at Doñana, a protected area in Southern Spain, where the species came back to breed in 1996, after many decades that the species was not reproducing in the country. Since then, the population showed a sharp increase fueling the expansion towards several other colonies in W Europe. The species has been the object of an intense monitoring program which has led to the development of a research line based on the Glossy ibis as an original and little studies model species. The workshop intends to extend the experience made at Doñana to create an international research network to share a common protocol and delineate objectives whose first aim is unravelling the ecological processes beyond the past and current distribution and abundance of the species all over the world. As a first goal that has been reached through the creation of the research network consists of a research study, partially funded by the Waterbird Society (Kushlan Award), that will investigate the Glossy ibis population structure and connectivity across the entire distribution range by combining nuclear and microsatellite markers. The meeting, organized under the auspices of the Estación Biológica de Doñana (CSIC, Spain), Tour du Valat (France) and the IUCN SSC Stork Ibis and Spoonbill Specialist Group will count on the participation of thirty researchers and technicians proceeding from fifteen countries of four continents where the species is currently present. The contents of the workshop, as well as other studies from participants of the research network, will be published in an online launching issue of the Stork Ibis and Spoonbill Conservation journal promoted by the homonym specialist group of the IUCN SSC. 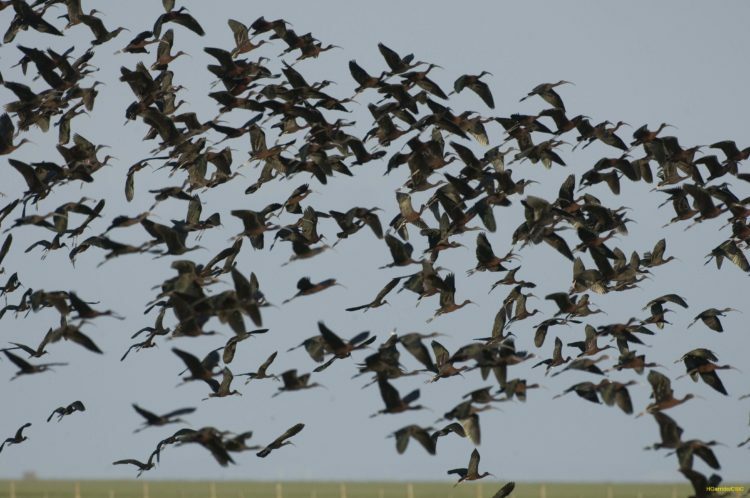 Featured image: Glossy ibises flying at Doñana marshland, Spain. © Héctor Garrido, 2008.